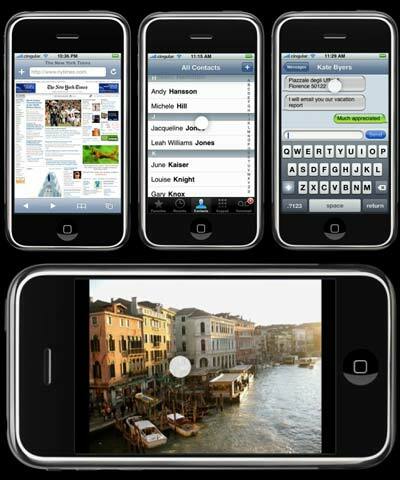 iPhone combines three products — a revolutionary mobile phone, a widescreen iPod with touch controls, and a breakthrough Internet communications device with desktop-class email, web browsing, maps, and searching — into one small and lightweight handheld device. iPhone also introduces an entirely new user interface based on a large multi-touch display and pioneering new software, letting you control everything with just your fingers. This is the ultimate device: beautiful phone with a ton of major feature and usability enhancements, iPod, PDA (running OS X), digital camera with Wifi, and Bluetooth in addition to the cell connections. Coming in June, though sadly, only to Cingular. This is the first time I’ve ever been seriously tempted to leave Sprint for cell service. 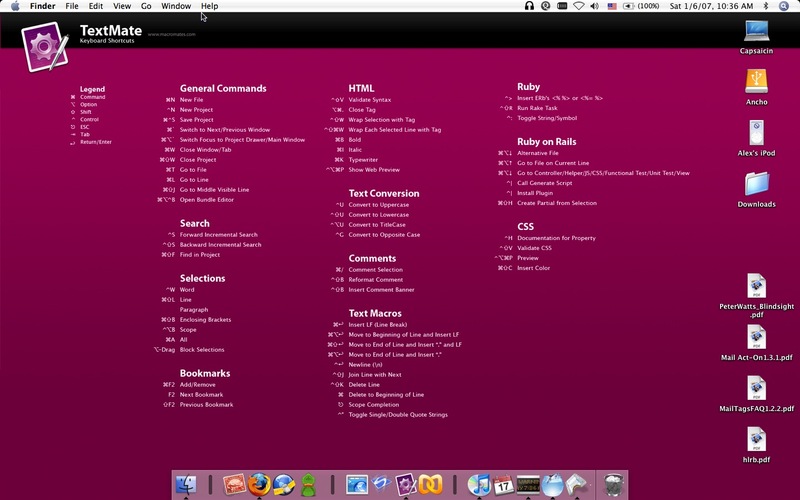 Wishingline has provided a handy desktop background (updated) that displays common TextMate commands. Like several other handy cheat sheets, the goal is to make it easy to look up oft-used shortcuts and snippets, improving development efficiency and knowledge of how the app works. The image shows it in use on my desktop. You can click on it to see the full size version. I don’t know what it is about the Mac, but I actually get excited about software again. I’m not talking about the big packages like Adobe’s Creative Suite or games, which I loved on the PC. I mean the smaller pieces of software like TextMate, Parallels or iTunes. This is a very interesting time in the software market for those of us running OS X. The products coming out of so many small software shops is beautiful and highly functional. Hell, they’re fun! Point in fact, I’ve been evaluating FTP apps for the last couple of months – nothing intense, just checking out different ones as time allows. After reading a bunch of reviews, and trying various products, I downloaded Yummy FTP and was blown away. It is fast and has a wealth of features, including FTP Aliases with Autorouting to make it easy to upload files without opening a connection to the server and then navigating to the proper location. Sweet! The smooth integration with other apps (like TextMate for remote editing) and the command line are just a couple of other features worth the price. Yet, even with all of the functionality it packs, Yummy FTP feels good to use – unlike so many apps from my Windows past. Plus, I lucked out and received a discount on the purchase via MacAppADay., taking the already-low price of $25 down to $10. Nice! I had initially downloaded a fully functional, though un-upgradable copy as part of that same MAAD promotion, but like so many others, didn’t realize that I had to register it immediately, so I didn’t get one of the 5,000 licenses. That said, after trying it out, I would have purchased a copy anyway to support the developer and get future upgrades.